What Is DA Form 137-1? 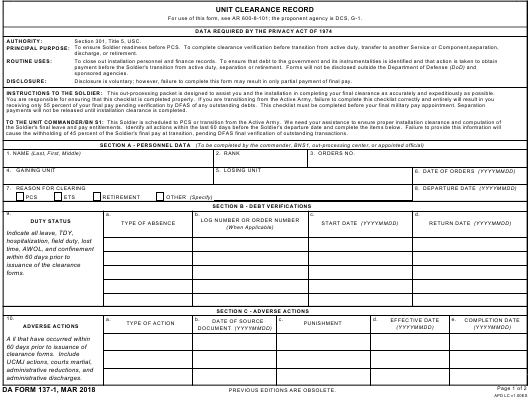 DA Form 137-1 or the Unit Clearance Record is a form used to ensure a soldier's readiness before a permanent change of station - or PCS - as well as for completing clearance verification before their transition from active duty, transfer to another service or component, separation, discharge or retirement. The form is used to close out any personal and financial records at the installation from which the soldier is transferring or retiring permanently. All debts to the government and any service branches must be paid in full before the date of separation, the transition from active duty of retirement. The latest version of the form was released by the Department of the Army (DA) in March 2018. An up-to-date DA Form 137-1 fillable version is available for download below or can be found on the Army Publishing Directorate website. The form supersedes the February 2015 edition with that and all other editions being obsolete. The 2018-issued version is approved for public release with further distribution unlimited by the law. The DA 137-1 is most commonly confused with the forms from the DD 137 series. The DD 137 is a four-part series that deals with verifying the dependency status of family members of Military personnel to determine their eligibility for certain benefits. For use of this form, see AR 600-8-101; the proponent agency is DCS, G-1. INSTRUCTIONS TO THE SOLDIER: This out-processing packet is designed to assist you and the installation in completing your final clearance as accurately and expeditiously as possible. payments will not be released until installation clearance is completed. cause the withholding of 45 percent of the Soldier's final pay at transition, pending DFAS final verification of outstanding transactions. SECTION E - BATTALION/UNIT CLEARANCE ITEMS. A check by an item confirms that the item has been verified and that necessary action has been taken. A full description of the DA 137-1 and an overview of all related procedures can be found in the Army Regulation 600-8-11, Reassignment, released in May 2007. Read the instructions carefully before completing the form. Failing to complete and submit the DA 137-1 may result in only partial payment of final pay. Separation payments will not be released until the applicant receives installation clearance. The form has five sections in total: Section A, Personnel Data, Section B, Debt Verification, Section C, Adverse Action, Section D, Property Accountability and Pay Items, and Section E, Battalion/Unit Clearance Items. Section A, Personnel Data, is mostly self-explanatory. Enter your name, rank, orders number, gaining unit, losing unit, date of address and departure date. Section B, Debt Verification, requires you to describe and verify your duty status and times you were absent on various occasions - whether it was a TDY, hospitalization or field duty. Enter the type of absence, the log number or order number if applicable, and the start and return dates of all absences. Section C, Adverse Action, is for describing all adverse actions that occurred within 60 days prior to the issuance of clearance forms. Include UCMJ actions, administrative reductions, and administrative discharges. Describe property accountability and pay items details in Section D, Property Accountability and Pay Items. The 'Pay Items' section includes specifying the type of incentive pay and any enlistment and reenlistment bonuses. Section E, Battalion/Unit Clearance Items, is one of the most important parts of the form. A check by an item confirms that the item has been verified and the necessary action has been taken. DA Form 137-2, Installation Clearance Record is a checklist with signatures to collect during obtaining the clearance verification.